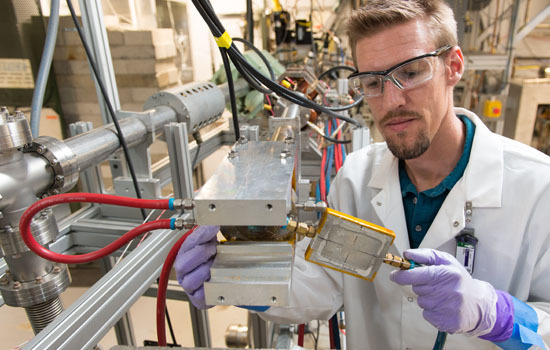 Argonne National Laboratory’s 50 MeV/25 kW electron linear accelerator can produce a wide range of useful radioisotopes for medical, national security, basic science and industrial applications. LEAF (Low-Energy Accelerator Facility) — LEAF's electron LINAC is equipped with three beam lines, enabling multiple target stations. LEAF — Argonne researchers use a modular target station to probe the activation of select targets. Various beam convertors transform the electron beam to photons in order to activate small targets. LEAF — Upgraded electron linac with maximum beam energy of 55 MeV, maximum average beam power 25 kW and maximum repetition rate of 240 Hz. LEAF — Researchers use hot cell facilities and customized equipment to separate and purify radioactive medical isotopes produced with the electron linear accelerator. 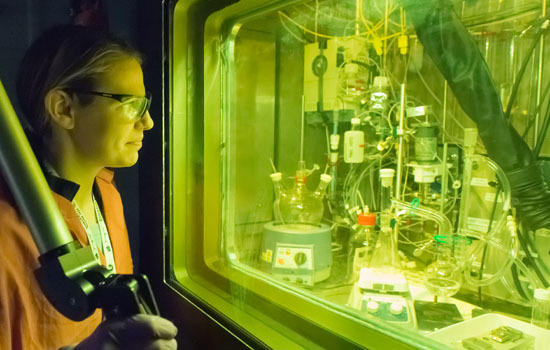 From its roots in the World War II-era Manhattan Project, Argonne’s Nuclear Energy program has grown to support peacetime uses of nuclear technology for the production of energy, scientific exploration and medical diagnostics and therapy. Particle accelerators are important tools in these efforts. Particle accelerators use electric fields to speed up and increase the energy of a beam of particles. These particles are steered and focused with magnetic fields. The Low-Energy Accelerator Facility (LEAF) consists of an electron linear accelerator (LINAC) and a Van de Graaff (VDG) electron accelerator. Originally built in 1969, the LINAC recently underwent a significant upgrade to increase the beam power and energy. Researchers in Argonne's Nuclear Engineering Division use the LEAF for a wide range of applications. 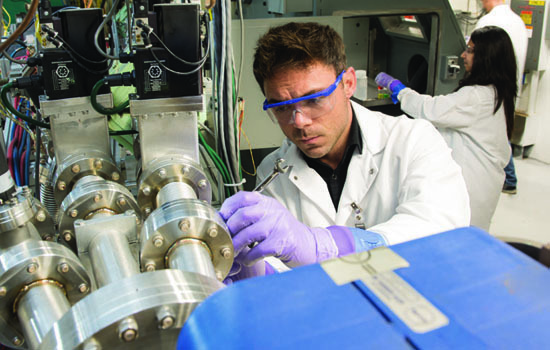 This talented team of radiochemists, chemical and nuclear engineers, health physicists and experienced technicians supports multiple programs on behalf of sponsors such as the U.S. Department of Energy’s (DOE’s) National Nuclear Security Administration, U.S. DOE Office of Science Isotope Program and the Defense Threat Reduction Agency. Classified as an accelerator facility by the U.S. Department of Energy, the LEAF operates under an approved accelerator safety envelope. A safety team that includes experts in health physics, ergonomics and industrial hygiene supports the facility. The electron linac can deliver continuous or pulsed beams with energy up to 50 MeV and average power of more than 20 kW. Several target station locations provide ample access for operations and post-run remote target transfer. 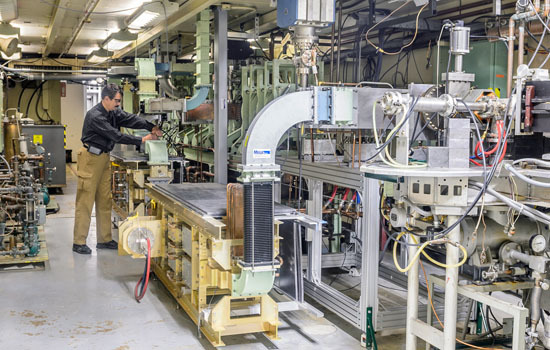 The VDG electron accelerator is used to investigate and test critical experimental equipment and materials for radiation hardness and stability. The low-energy (3 MeV) VDG accelerator is capable of Pulse and Continuous modes. The VDG accelerator provides the capability to deliver high levels of electron/photon dose rates to critical components without presenting activation and handling hazards of the irradiated targets. The Nuclear Chemical Engineering Department of Argonne’s Nuclear Engineering Division offers a wide range of expertise, capabilities and facilities, described below. Results from an unsteady, 3D, multiphase CFD simulation including heat transfer using modified Open FOAM solver two-phase Euler Foam. Full helium gas headspace and sample in/out flow included and volumetric heat generation rate used directly from MCNP6 simulation results.